A range of gift ideas for those hard to buy for vegetarians and vegans for all occasions. For non- vegetarians it can be a nightmare trying to decide which gifts are suitable for vegetarians, and it can be even harder to buy gifts for vegans. Fear not, however, because fantastic gifts are just a mere click away, and are sure to put a smile on the faces of your vegetarian/vegan family members, friends or loved ones. Whilst those who eat meat, or have never had to buy for a vegetarian, may think that buying gifts for vegetarians is really straight forward, the reality is, that it is not. Did you know that regular cheese, for example, contains a substance known as rennet which is essentially an enzyme taken from an animals stomach, usually from a calf or a cow? Or that many alcoholic drinks, including wine, contain substances which are derived from animal bones, or fish swim bladders or ox blood? Many occasions such as birthdays, Valentines Day and Christmas, of course, come around every twelve months, which means that if you've been buying gifts for a vegetarian for number years, it can become increasingly difficult to find that perfect gift each year. Once you have given a number of CD's and DVDs, not to mention copious amounts of jewelry, aftershave and perfume, you may think that you've exhausted every option, but you haven't. There are an array of different and unusual gifts for vegetarians which you probably haven't even considered yet. The Vegetarian Lifestyle Gift Basket. 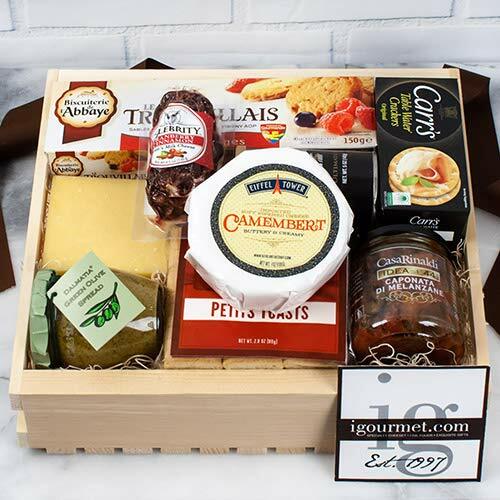 If you've been searching for a really special vegetarian gift, then the Vegetarian Lifestyle Gift basket has it all. 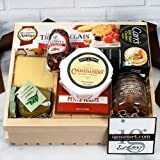 A mouthwatering selection of gourmet foods and treats are contained within the basket which include; cheeses, preserves, biscuits, candy and mini toasts. The premium items contained within the basket are selected from various locations around the world. Vegetarian Awards Coffee Gift Basket. 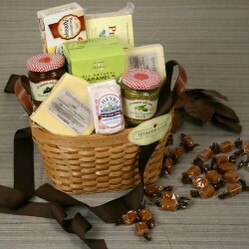 The vegetarian awards coffee gift basket is ideal for the vegetarian who appreciates a good cup of coffee. Contained within the basket are two 15oz mugs, 4 coasters; with illustrations, and a fine collection of coffees which have been selected from around the world. The vegetarian coffee enthusiast will find that the basket contains Kenya AA, chocolate and Italian roast epresso, French vanilla and decaf Colombian supremo. Perfect! A biscotti cookie is also included. This fine selection of coffees comes beautifully packaged in a Black planet coffee gift box. 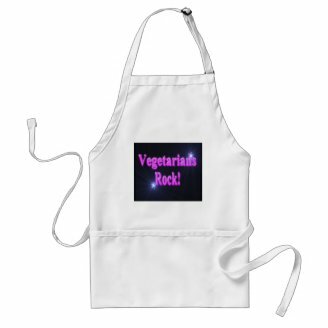 Show your appreciation for all those wonderful vegetarian dishes that you've sampled over the years, by giving the "vegetarians Rock" apron. The apron is available in three colours; white, tan and lemon and is made from poly/cotton twill blend. This product can be used in the garden, the kitchen or used when painting or carrying out other household taskS and is made in the USA. The apron can be personlised with the name of the recipient of the gift, or other message. Ideal for the vegetarian in your life. 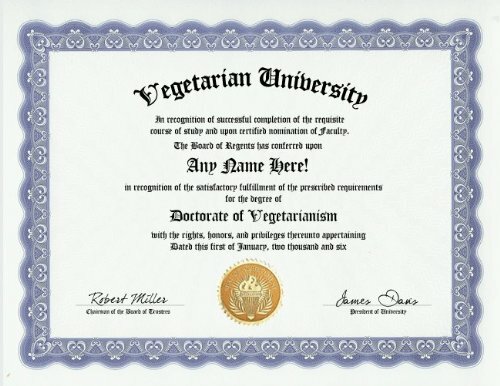 Why not treat the vegetarian in your life to this humorous Vegetarian Vegetarianism Degree Certificate? The certificate is printed on premium paper and includes a gold embossed seal. When ordering, simply fill out the recipient's name for that personlised touch. The Quick Fix Vegetarian Cookbook is perfect for the vegetarian who enjoys delicious, home cooked vegetarian meals but doesn't want to spend hours cooking them. There's even a section devoted to make in advance meals which can be popped into the oven when required. The book contains 150 mouthwatering, yet quick and easy to prepare vegetarian meals. 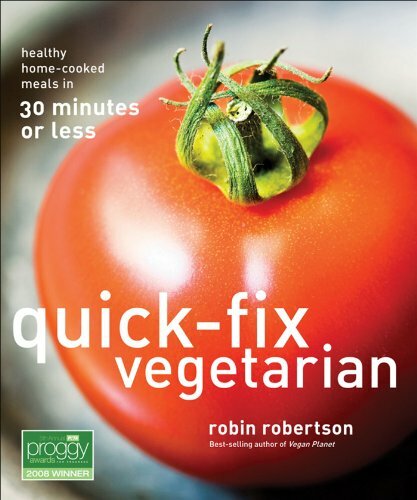 Quick Fix Vegetarian cookbook is the perfect gift for the vegetarian with limited time on their hands. Anyone who's tried to find the right gift for a vegan friend or loved one will no doubt be aware just how problematic this can be. Not only do vegans not consume meat or dairy but they will not wear or use any items which have been manufactured using animal byproducts. It can be a laborious task having to research specific products to ensure that they are suitable for vegans. Fortunately, the gift items featured here have been carefully researched to ensure that you can give your vegan friend or loved one a gift that wont offend. 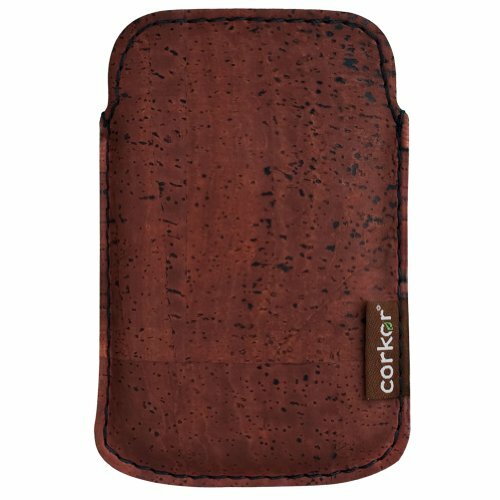 Made from 100% cork fabric, the Blackberry 9900 phone case is a natural, renewable and sustainable material. Completely leather free, the 9900 case is the perfect gift for the vegan who owns a Blackberry. 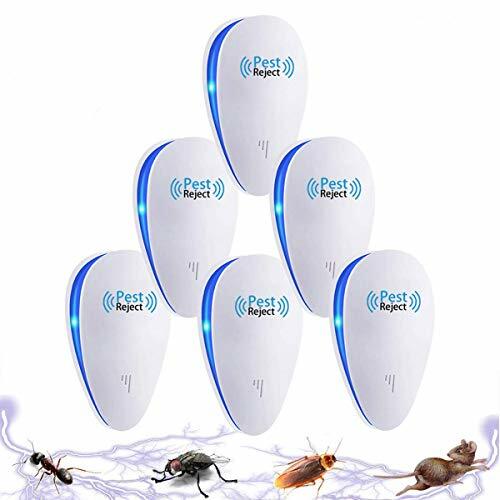 The material is stain resistant, waterproof and also contains a soft interior lining which will not damage the screen, but protect it from scratches and dirt particles. An excellent product which is suitable as a gift for men and women. Vegans who love cookies will adore the Vegan Cookie Gift Basket. The smaller basket contains peanut butter, chocolate chip, oatmeal raisin walnut, banana nut, lemony lemon and cinnamon twist cookies. Who could resist? All the cookies are made from 100% natural ingredients, no hydrogenated oils or GMO's. The Vegan Cookie gift basket is also gluten free. Chocolates are a classic gift, but when it comes to buying chocolates for vegans it can be a daunting prospect. Of course, non-dairy dark chocolate is normally suitable for vegan consumption, but sometimes the fillings are not vegan friendly. Enter the Creek House chocolate collection, vegan friendly chocolates and filling, presented in an elegant gift box with ribbon and a gift tag. An ideal gift for the vegan chocolate lover. Tower of Gourmet Vegan Breads and Treats. The Tower of Gourmet vegan Treats comes beautifully packaged and is bound to tempt any vegan whatever the occasion. 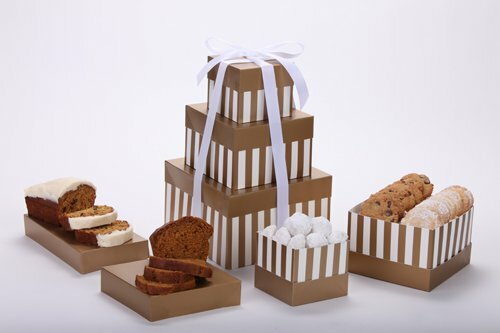 The three tiers contain a gourmet assortment of cakes, breads and cookies. All ingredients, are of course, vegan friendly and contain no artificial ingredients, GMO oils or products containing gluten. 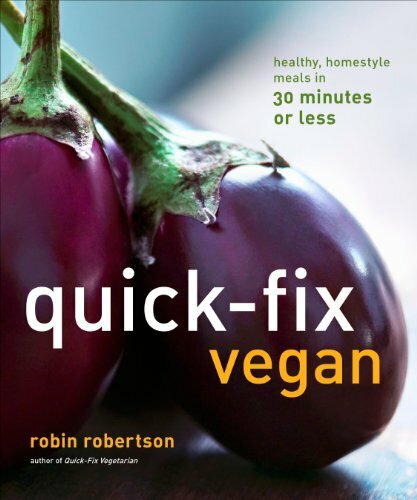 Penned by the much celebrated Robin Robertson, a vegan and restaurant chef who also authored Quick Fix Vegetarian, the Quick Fix Vegan cookbook contains 150 vegan recipes from starters and dips to desserts. All the recipes can be prepared in under thirty minutes making it the ideal gift for the foodie vegan who has a very busy lifestyle. A Vegan Saved My Life Clothing. A Vegan Saved My Life Clothing pays homage to the sacrifices made by vegans. A cute chick is featured along side the inspirational message and the clothing range is available for both men, women and children, in addition to being featured on other household items and accessories. There are more than 90 different clothing styles featuring the logo and it is made from 100% baby jersey knit. 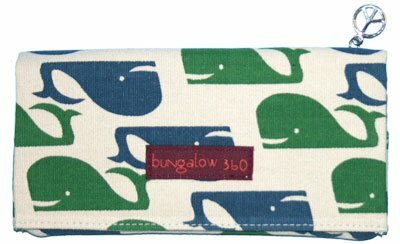 Bungalow 360 Whale Vegan Wallet. The Bungalow Whale Vegan wallet is manufactured using 100% natural canvas, contains 6 card pouches, a bill pouch and a zipper pouch. Ideal for vegans, the wallet is just one item in the range which includes tote bags, satchels and wristlets. Where to Buy a Tagine Pot online ~ What is a Tagine Pot? Create cheap vegetarian meals, for under $1.72, for families, students, singles and older people. Make green bean and corn barley risotto, Spanish eggs and mushroom curry. Exploring the benefits of cooking with a tagine pot and which features to look for when buying a tagine pot online.